Almost every leap year the good people of the United States suggest a new executive leader to the electoral college. Power players queue up to pad the pockets of the PACs, mainstream media maintains the mostly mindless coverage set about 3 years prior, and average citizens furiously feign foreign policy facility. This January 2012 is no different. Michelle Bachmann was widely thought a spoiler in Iowa, but news of her departure cranks to 11 the excitement knob for the 2012 race. To grow a beard. Above is an advanced computer simulation* of what the major three candidates should look like by November 6th if they expect my endorsement. 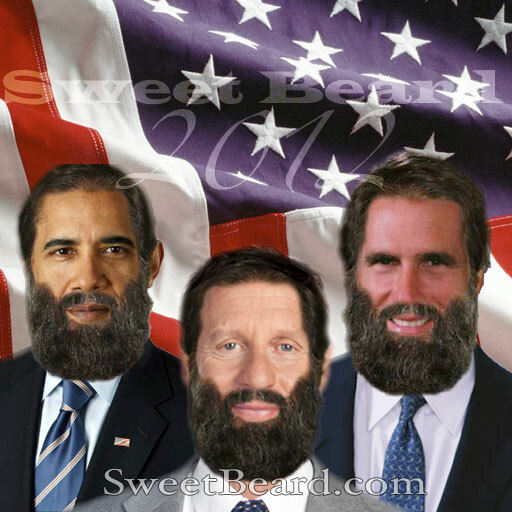 The crack team of pogonotrophic journalists at sweetbeard will be closely following the facial follicles of each candidate throughout the year, and may the 2013-2016 administration be a bearded one.